ELECTION DAY IS TUESDAY, NOVEMBER 7 -- BE READY TO VOTE! June 1st, 2017: Election Season is Here! December 2, 2016: 421-A Back from the Dead? New $ for Public Housing, and ZoneIn! October 27, 2016: What's at stake for New York City on Election Day? June 9, 2016: A Lot to Watch for On Housing: Next Rezonings, New Legislation, State MOU? 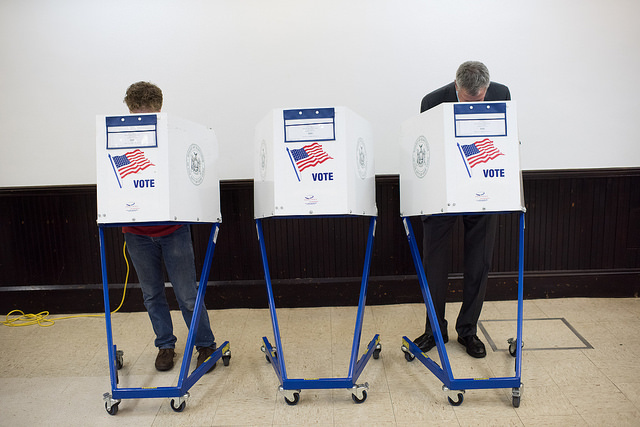 April 8, 2016: The presidential primaries are here - in New York! You can find more from Ben Max and Jarrett Murphy by visiting the latest reporting from Gotham Gazette and from City Limits; and find us on Twitter @TweetBenMax and @JarrettMurphy. 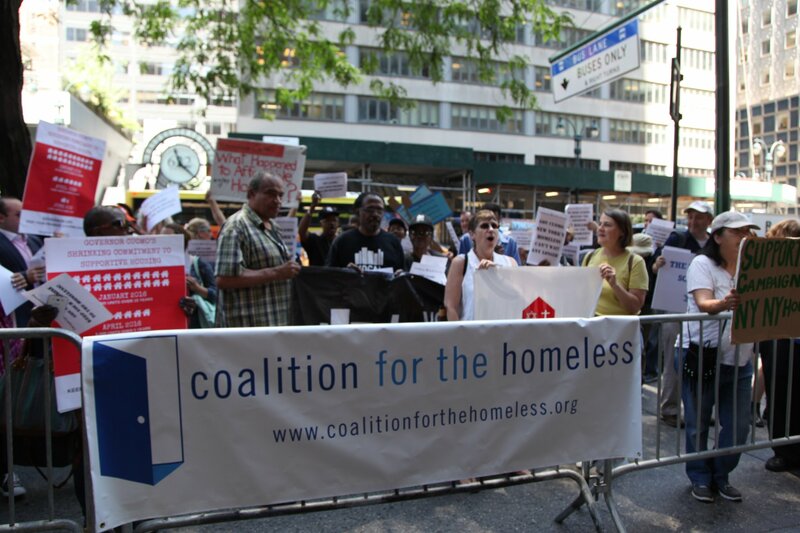 On Thursday, June 23, the two leaders of Coalition for the Homeless, Mary Brosnahan and Shelly Nortz, talked with Ben Max of Gotham Gazette and Jarrett Murphy of City Limits about where things stand in terms of city and state efforts to curb homelessness. The discussion centered around the recent end of legislative session in Albany and the fate of nearly $2 billion in state money dedicated, but not released, for homelessness prevention and affordable housing. City efforts to improve homelessness prevention, shelter conditions, and management of services were also a key part of the discussion, including assessing the de Blasio administration as it works to correct its record on those subjects. Turning 21 is a milestone with a different meaning for a homeless youth in New York. When that day arrives, he or she usually must leave the city's youth shelter system, and they also lose many essential services. If they haven't found permanent housing on their own, they are forced back out onto the street. They can go into the large adult shelter system, but most youth don't feel safe mixed into the general adult population. Yet the city's supportive housing and the new LINC housing program are accessible only through shelters, meaning young people can miss out. 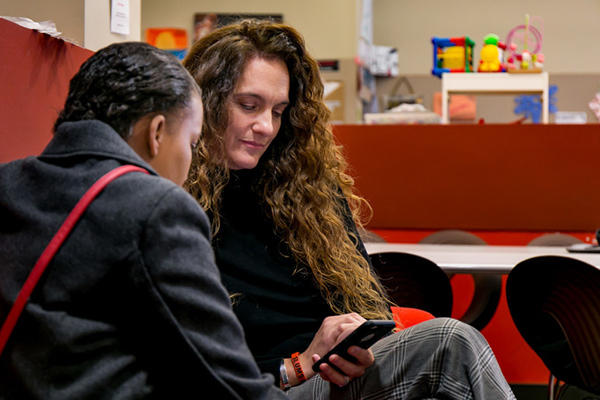 "The youth population is not provided with anywhere near enough resources to prevent them from becoming chronically homeless adults," says Craig Hughes, Assistant Director of Resource Counseling at Safe Horizon's Streetwork Project. "Without access to housing subsidies provided by the City, as well as resources such as public housing and consistent access to supportive housing, far too many homeless young people are at significant risk for violence, abuse and exploitation." 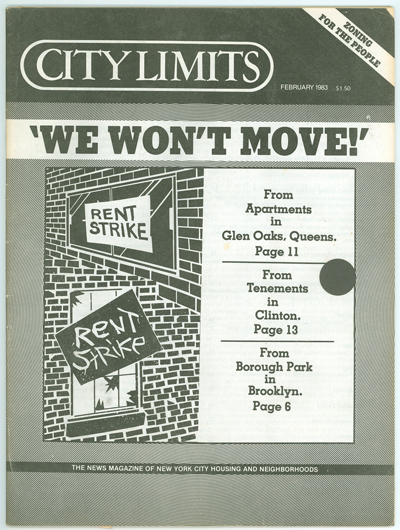 Since its start 40 years ago this month, City Limits has published millions of words about hundreds of topics and survived thanks to the smarts and sacrifice of dozens of journalists. The history below, combining an essay my predecessor Alyssa Katz wrote on the occasion of our 30th anniversary with my own update on the past 10 years, doesn't pretend to capture all the people and projects that made City Limits what it is. 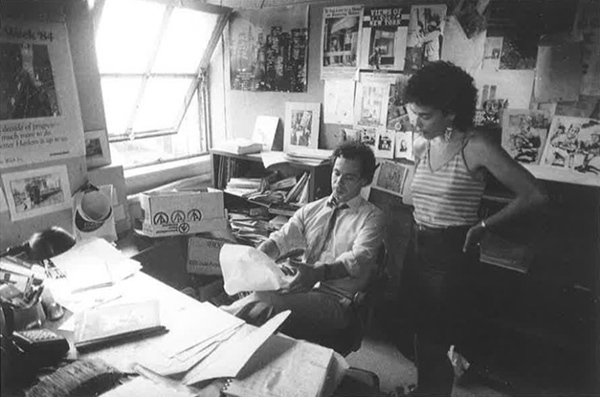 Hopefully, however, it does give a sense of where City Limits came from, the changes it has seen and the values that continue to drive our journalism four decades in. –Jarrett Murphy. The headlines were forceful, printed in capital letters. They came from a publication that spoke to its times. In 1976, New York City's neighborhoods were facing crushing challenges unlike any they had seen before. The city's fiscal crisis had left New York with few resources and a growing sense of doom. In many neighborhoods, arson and abandonment of apartment buildings were becoming everyday occurrences, as some property owners determined that their real estate was worth more in insurance proceeds than it was for its rental income. By the summer of 1977, more than 20,000 buildings in New York would be abandoned. At the end of that year the city owned 6,000 buildings and was poised to foreclose on 25,000 more. When Mayor de Blasio arrived in Albany on Tuesday, he had a lot to talk about: aid to CUNY, cost-sharing for Medicaid, mayoral control of the schools and more. Instead, upstate lawmakers wanted to talk about a property tax cap. New York City is the only place in the state that doesn't have one, and apparently that irks Republicans. 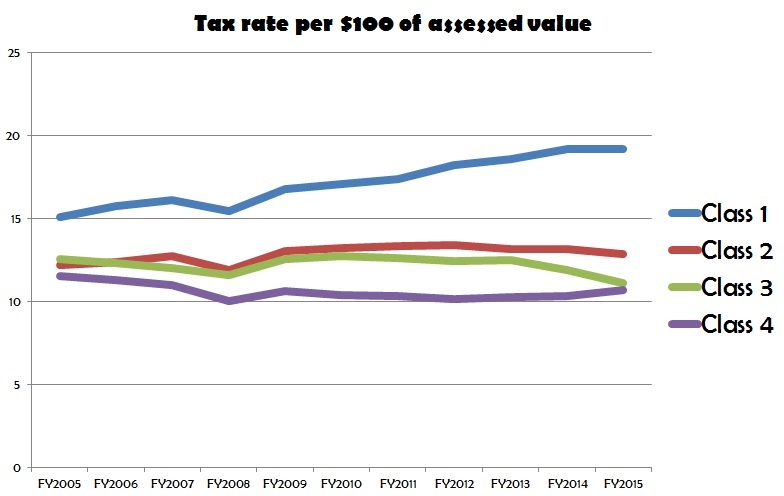 The property tax is one of the few revenue lines that the city controls on its own. If it wants to raise other taxes, like the income tax, it has to go to Albany for approval. That fact is probably not unrelated to the push to get the mayor to surrender his authority to raise the property levy. The property tax accounts for about 40 percent of the city's revenue each year, twice as much as the personal income tax (about 20 percent) or sales tax (roughly 14 percent). Mayor Bloomberg oversaw a significant increase to close the post September 11 budget gap, a move that hurt his first-term popularity a lot. As the chart above indicates, growth in the tax rate has been modest; it actually dropped last year on "class 1" properties. Since property tax revenue grows with property values, those numbers (in the chart below) rise a little more, especially for some classes of properties. Read more about NYC's property tax non-problem from City Limits here. In 2009, New York State officials said the Green Jobs/Green New York program would retrofit a million houses and create 14,000 jobs. The results fell well short. Are there lessons to be learned for Gov. Cuomo's new wave of energy innovation? When the Green Jobs/Green New York bill was signed in 2009, there was talk of delivering both energy efficiency and economic justice. But prospects for real progress were narrowed by negotiations over the law. Some borrowers report positive experiences—and significant savings—under the Green Jobs/Green New York program. But others had a frustrating time with the loan program's rules and processes. New York charted a new path to energy efficiency, using "on-bill financing" so low-income homeowners could get retrofits they couldn't afford up front. But utility companies, lenders and ratings companies all made demands and decisions that made the approach a poor fit for households of limited means. James Eleby turns discarded scrap wood into new tables at a Brooklyn factory. Learn how he got a foothold in the green economy. Some hoped the Green Jobs/Green New York program would produce as many as 14,000, but it appears to have generated but a few hundred. People who worked with the initiative said abundant paperwork and an under-developed market were part of the problem. Go inside the classroom and hear from an instructor who's helping to train the new green workforce. 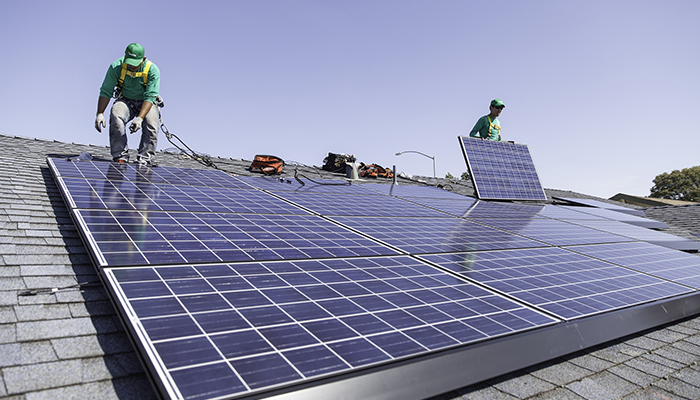 A few years ago, from New York's City Hall to the state house to the Obama administration, everyone was excited about the prospect of creating thousands of green jobs. The result differs from the rhetoric. It isn't that green jobs don't exist. It's that instead of new jobs materializing, existing jobs got greener.